Once again Bing has posted a picture which will appeal to knitters, and other fiber artists. This time the picture was on the Canadian Bing site. What a great picture of muskox (muskoxen? 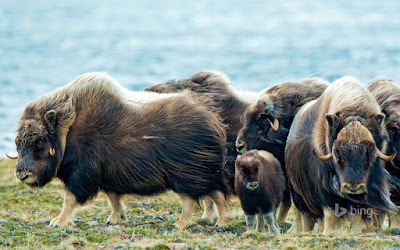 muskoxes?). The only place I've ever seen them is at the Calgary zoo. One day I'd like to head north and see them in the open.. The yarn made from their undercoat is luxurious: very, very soft, hypo-allergenic and 8 times warmer than wool. It's called qiviut. By the way, that's a good word for Scrabble - no "u" after the "q". The yarn is expensive, but I think that every knitter should knit with it a least once in their lifetime. If you'd like to learn more, I suggest Donna Druchunas' book, Arctic Lace. Donna is a friend and I was a test knitter, but I would highly recommend this book regardless. It's excellent.